This week I’m participating in a blog hop with “The Salad Bar” and our theme is salads using avocado. Our local seafood market always carries tiny Canadian shrimp that are super plump and moist, so paring them with ripe Haas avocados seemed a natural match. And so, my shrimp salad-stuffed avocados came to be for our lunch the other day. Fresh dill and parsley, plus fresh Meyer lemon juice, took away any need for more than a touch of celery salt, keeping this a healthy, low sodium salad. Celery, scallions and sweet red pepper added a nice crunch to contrast with the creamy avocado and juicy shrimp. TIP: Tossing the avocado halves with Meyer lemon juice will keep the avocado from turning brown, if you want to fill and chill the avocados a while before serving them. Ripe, creamy avocados are stuffed with succulent shrimp salad. Using a medium-sized non-reactive bowl, combine the mayo, celery, scallions, red pepper, dill, parsley, 1 tablespoon (3 teaspoons) lemon juice, celery salt and white pepper. Add the shrimp and stir gently into dressing. Toss the avocado halves with remaining 1 teaspoon lemon juice. 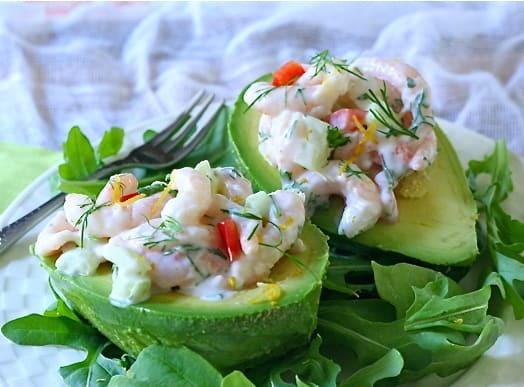 Fill each avocado half with ¼ of the shrimp salad. Place 1 cup of greens on each plate, top with 2 shrimp salad-stuffed avocado halves. Liz, as always, a great recipe! I love the combo of the shrimp and avocado. I wish I lived next door so I could partake in your Meyer lemon bounty! I will remember to bring you some Meyers next time we meet! I can’t think of a better combination – especially with meyer lemon. Perfect for a summer day. Thanks, Lynda – it is finally summer here and now my head needs to focus on more warm weather recipes. Love it Liz – great idea. My neighbor brought me avocadoes from the oldest avocado grove in CA. But sadly they are gone. Hope to replenish and think this would be a great quick dinner on a weeknight! It is – and was – a quick lunch or supper for summer, Beth. Looks refreshing and the perfect salad for hot summer nights! Thanks, Heather – it’s a great blog-hop this morning, isn’t it? Thanks – wish you were closer and could share with you. Love this, avocado and shrimp are one of my favourite matches. This sounds delicious! Hi Jayne -thanks and talk with you soon. Great comment – never thought of the avocado as “an edible bowl” – thanks. This sounds delicious. I love avocados and shrimp together, and your photos are great! Thanks, Michelle – it’s fun to check out everyone’s recipes. Wow…those Meyer Lemons are a gift that just keep on giving, huh? Beautiful salads, and a classic combination! And the tree in front is covered with new blossoms – thanks, Steve. You are so right, Greg! What an amazing lunch with my favorites: avocados, shrimp and Meyer lemons!